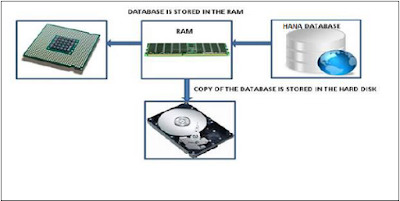 An In-Memory database means all the data from source system is stored in a RAM memory. In a conventional Database system, all data is stored in hard disk. SAP HANA In-Memory Database wastes no time in loading the data from hard disk to RAM. It provides faster access of data to multicore CPUs for information processing and analysis. SAP HANA is Hybrid In-memory database. It combines row based, column based and Object Oriented base technology. It uses parallel processing with multicore CPU Architecture. Conventional Database reads memory data in 5 milliseconds. SAP HANA In-Memory database reads data in 5 nanoseconds. It means, memory reads in HANA database are 1 million times faster than a conventional database hard disk memory reads. Analysts want to see current data immediately in real time and do not want to wait for data until it is loaded to SAP BW system. SAP HANA In-Memory processing allows loading of real time data with use of various data provisioning techniques. HANA database takes advantage of in-memory processing to deliver the fastest data-retrieval speeds, which is enticing to companies struggling with high-scale online transactions or timely forecasting and planning. Disk-based storage is still the enterprise standard and price of RAM has been declining steadily, so memory-intensive architectures will eventually replace slow, mechanical spinning disks and will lower the cost of data storage. In-Memory Column-based storage provides data compression up to 11 times, thus, reducing the storage space of huge data. This speed advantages offered by RAM storage system are further enhanced by the use of multi-core CPUs, multiple CPUs per node and multiple nodes per server in a distributed environment.